White sand beaches. Palm trees galore. Crystal clear 29 degree water. Guaranteed stunning sunset over the water every day. Island hopping. And laid back, hassle-free locals. This is the quintessential family beach holiday. On our travels around southeast Asia, one place kept being recommended to us: Koh Lanta, two islands in the Andaman Sea where tourists can dive and escape the party scene. Pinterest or Instagram Koh Lanta and you will find spectacular images of beach sunsets with traditional fishing boat silhouettes on the water taken from one of the island’s nine beaches along its sunset coast. It’s also a much more laid back place to use as a base for island hopping and diving. Waking up in your beach bungalow, slipping on a swimsuit and walking down a sandy path to a beach bar on stilts. The breeze from the Andaman Sea keeps this part of the beach cool enough most of the day to enjoy breakfast, lunch and sundowners without breaking a sweat. As you drink your fresh mango juice you plan where to go today…shall we see what’s on the other side of those rocks? Shall we take a tuk tuk to a beach further afield? Where should we eat tonight? You spend the morning in the swimming pool with the kids and do your workout on the beach facing the water and the breeze while your baby naps in her tent under a beach hut. After she wakes, the whole family scales the rocks down the beach and finds more jungle and a new, almost empty beach right next to yours. In the late afternoon everyone hops in a tuk tuk and you go to another beach where all the families seem to gather at this time of day. You order some drinks at a beach bar as the children play in the sand in front of you. Then you order your dinner and every takes a stroll down the beach to watch the sunset. The temperature is comfortable again, and the air feels fuller as it fills with sunset colours. You look around and everyone is smiling and at their best with this view. You sit down for your meal and watch the last bits of sun sink into the sea. While you continue to enjoy your meal the sky turns dark red, then brightens up again with oranges and yellows, then turns dark again — the equatorial equivalent of the northern lights. 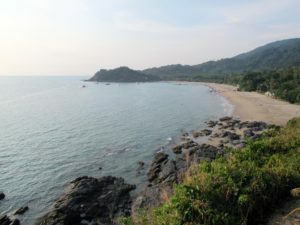 Koh Lanta’s main island is 30 km long and 6 km wide with nine beaches from north to south along its western sunset coast. Between the beaches are clifftop bars and winding roads, and the eastern coast of the island has mangroves and its historical town: Lanta Town. Most tourism infrastructure centres around the northwest tip of the island where the big ferry terminal to Phuket and Krabi can be found, and travelers needing supplies like baby food or anything atypical will need to go to the town around Saladan Pier on the island’s northern tip. 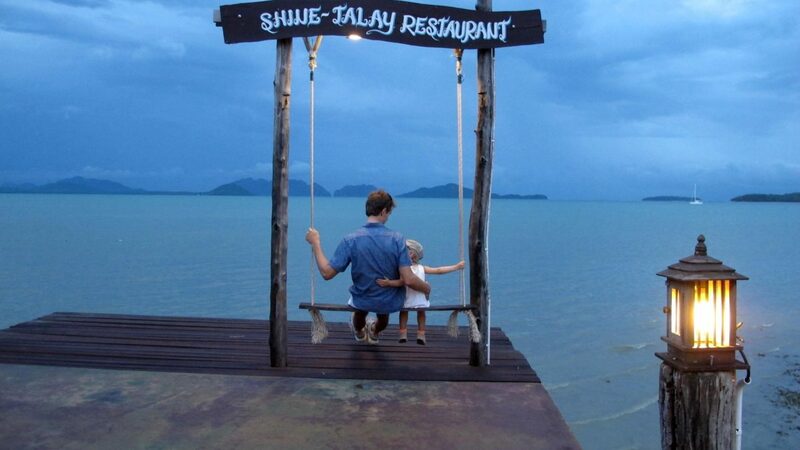 Koh Lanta is a Muslim Island — 90% Muslim, compared to Thailand’s national average of 5%. This gives Koh Lanta a very different feeling than other parts of Thailand. The landscapes are very Thai, with the area’s characteristic rock islands that look as if they have been picked up and dropped in the middle of the Andaman Sea dotted everywhere around the island. But culturally and architecturally Koh Lanta has a very different look and feel. Elaborate Thai temples and buildings are replaced by modest mosques, and most of the island’s buildings have a temporary look and feel. We found the people to be very laid back and we enjoyed being totally hassle free (rare for Thailand! ), but the local people felt the most inaccessible and private than any where else we have been in southeast Asia. 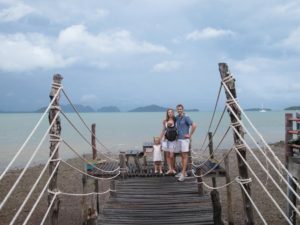 It takes quite a bit of time to get to Koh Lanta from other parts of Asia, as you need to first fly into Krabi or Phuket, and then the next day take an indirect ferry to the island. We also found two weeks to be too long to spend on the island unless you are a dive enthusiast or an ex-pat with a community on the island. If you like relaxing on the beach surrounded by crystal blue waters without being hassled by anyone selling to you, then this is your place. The main activities for visitors to Koh Lanta are beaching and diving. Each beach has its own character, diversity of restaurants and shops and prices. 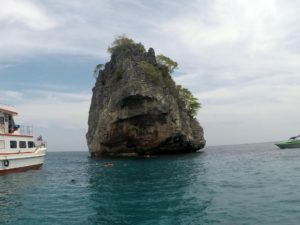 We decided to split our stay between two different beaches to sample the variety of the island and save on transportation costs, and by the time we left the island we had seen all nine beaches on offer. Every beach has at least one bar with a happy hour special around lunch time and another before 6PM, usually 100 baht cocktails. Many beach bars offer shelter in the heat of the sand, some with tatami mats, some with huts, some with umbrellas. And many of the beaches have beach volleyball available or kayak, SUP board and other water vessels available for rent. Thailand is acclaimed for its diving and the Andaman Sea does not disappoint. From Koh Lanta you can easily access its famous neighbour Koh Phi Phi, but go the other direction and there are all sorts of options. The excursions seemed to be mostly centrally organised but sold locally by everyone from your waiter to the resort where you are staying. There are dozens of places to visit — beach islands, dive spots, snorkeling spots, mangrove kayaking, underwater caves and much more. Each tour package will include a number of spots, with larger tours taking fast boats and smaller tours by longtail boats. There are so many tours available that you should find what you are looking for, but if not you can always hire a private longtail boat for the day. Prices varied greatly — not just longtail boat vs. fast boat, but also vendor to vendor. We bought our tour from the shopkeeper at our resort, but we had already compared this with a few other shops from another beach. We paid 1400 baht per person, and another couple on our tour paid 2200 baht per person for the same tour. International tour companies, like Kontiki, also exist but were double what we paid, but probably also had better safety practices and more professional staff. We took did the two island tour (Koh Rok – two snorkel stops, Koh Ngai – lunch stop, Ko Ma – 1 snorkel stop) by fast boat, which offers three very different snorkel spots plus lunch on a beautiful beach island. Koh Ngai might be the most beautiful beach I’ve ever seen, with the softest sand I’ve ever seen. We had the option to skip the first two snorkel spots and spend the morning on the beach before the tourists arrive, and if you love beaches I would recommend doing this. You can also stay overnight on the island but this has to be arranged ahead of time and only a few dozen people can stay per night. Aside from a few child-friendly restaurants (listed below), there was little to do on the island specifically for kids. 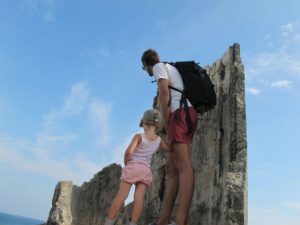 There is an entire Swedish community of families who live on the island, and even two Swedish schools, but speaking to English-speaking expats they said what made it family-friendly was simply the lack of parties and slow pace. Our toddler was happily occupied with the beach — making sand castles, playing in the waves, kayaking, etc. And on our tour we didn’t have to pay for children under the age of 4, and the boat staff were very happy to look over them sleeping on the boat as we snorkeled child-free (!). Perfect beach to enjoy the sunset with your family. This may have been the best meal we ate in Thailand. We had the “three flavours” fish of the day and it was amazing. Perfectly fried, perfectly seasoned. We shared one between the two of us and our toddler (plus rice). Truly unique tapas, we were delighted by all the surprises on the menu. Don’t miss the salmon with pomelo or duck prosciutto with fig — they were our favourites but everything was excellent. Truly delicious burgers — we were told by a regular that they fly their meat in from New Zealand. Great view on a lovely relaxed beach. Have a sundowner, order your food then take a stroll down the beach and when you get back your food appears. Perfect way to spend an evening. We went back to Cook-kai again and again to enjoy delicious Thai food at mid-range prices. It’s a family-run restaurant and most of the furniture has even been made by family members. The curries are superb and I especially enjoyed the glass noodle seafood salad. Take a stop here along the road at sunset and watch the view as you sip a delicious fruit smoothie. This place is highly recommended on Tripadvisor, and the staff and owners really care about maintaining their reputation. They are known for their mojitos and they will not disappoint. Excellent place for families with young kids — your kids can play while you enjoy a meal in peace. Lots of fans to cool off and hut tatami seating so your baby can crawl around. Good burgers — especially the veggie burger. Bobby Big boy Seafood&Bar – Bobby spent 17 years living in Los Angeles learning how to cook Thai food for American palettes, and the result is delicious Thai food that’s easy on the spice, but a bit pricier than nearby restaurants. He has a large outdoor play area behind the restaurant which you can see from some of the tables, perfect for families. He recommends the curries, but they are all made with peanut butter so we couldn’t try them, but the rest of the menu did not disappoint.